Physical media isn’t as popular as before as streaming service has almost taken over its place. But if you want to enjoy a movie at home with the best quality you can have, physical media is still your best bet. Now with 4K getting more popular, 4K TV and Blu-ray players are also becoming more common. You can enjoy a 4K Blu-ray movie at home, which provides significantly better experience than streaming services. While physical media like Blu-ray surpasses streaming service in quality, it’s not as convenient as the latter and it carries the risk of being damaged. If you prefer to stick to Blu-ray for movie watching, then you should probably have your Blu-ray discs backed up properly. One way to back up a Blu-ray disc is to create an ISO image file of the disc on your computer which would allow you to create a new disc later using the image. When you have some of your favorite movies on Blu-ray, it’s always a good idea to back them up. There are some excellent programs you can use to create an ISO image from your Blu-ray discs. Check out what programs you can use as an ISO creator and how to use them to make a backup of your Blu-ray discs. 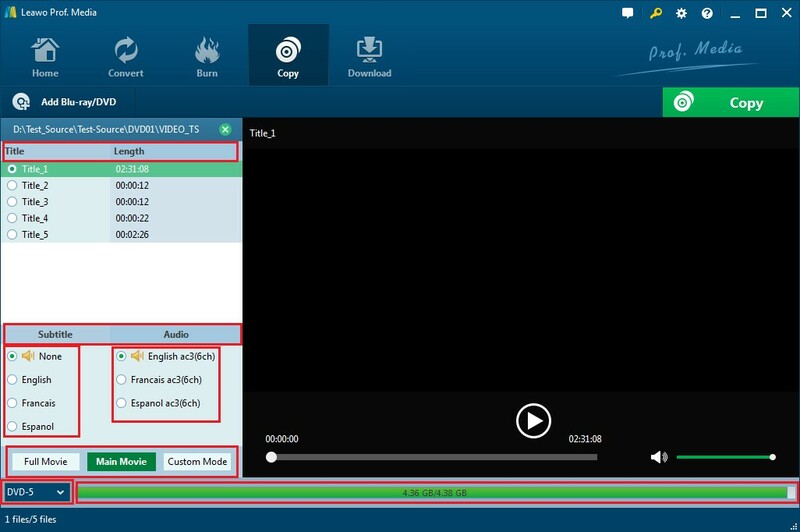 Leawo Software is a leading company in developing Blu-ray/DVD processing software and Leawo Blu-ray Copy is one of it proud products that can copy Blu-ray disc to your computer. 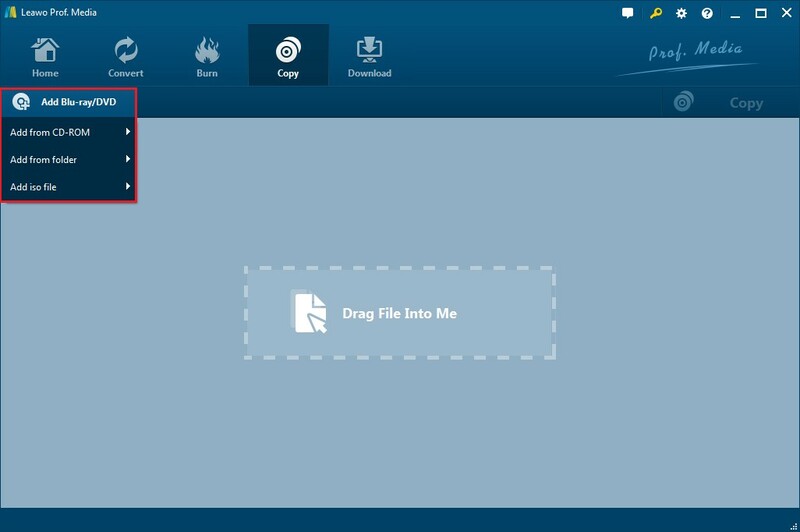 You can use it to create an ISO image file of the Blu-ray disc. And that’s not the only option you have for backing up your Blu-ray disc. 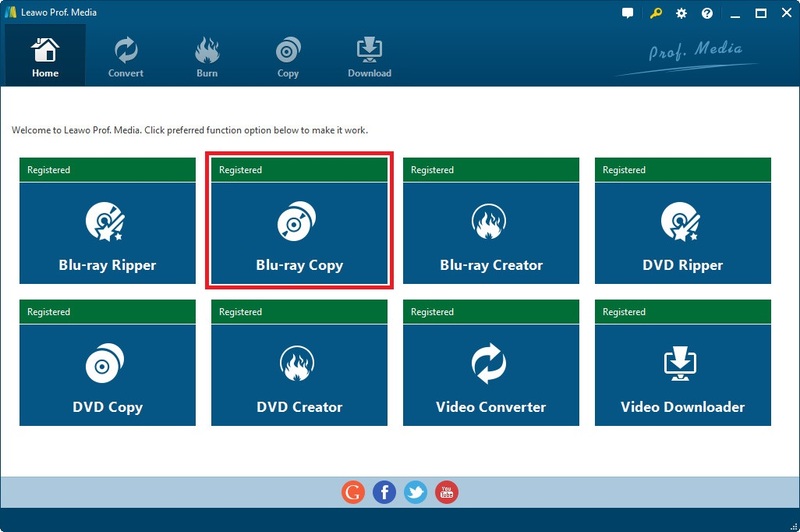 You can also copy the Blu-ray folder to your hard drive or directly copy the disc to another disc using this program. It meets our needs of creating ISO image from Blu-ray discs perfectly. And it’s got a user-friendly interface that even novice wouldn’t have a problem using the program. The ISO image creating process can be done within 5 steps. Detailed steps are as follows. Note: A Blu-ray drive is required for your computer to read a Blu-ray disc. Make sure the disc drive in your computer or your external drive can read Blu-ray discs. Insert the disc into the disc drive before the process starts. Step 1. Like a lot of other software developing companies, Leawo software uses the marketing strategy of packing several different products in the same suite. So Leawo Blu-ray Copy is inside a program called Prof.Media. Fire it up and from the top row of icons, find Blu-ray Copy and click on it to get to the Blu-ray Copy interface. Step 2. You should see a sign in the center of the blank area on the interface to let you know that you can drag the DVD content in the disc directly to the program. That’s one way to import the DVD content. Another way is through the Add Blu-ray/DVD button that locates in the top left-hand corner of the blank area. Step 3. After the disc content is loaded into the program, all parts will be listed clearly in different sections on the interface. On the left column are the video title list, audio track list, subtitles list and 3 copy mode buttons. On the right is the built-in video player for you to play the video in the disc which you can use later to help find the videos you need in the disc. If you choose Full Movie mode, you will have all data included in the output ISO image file. And for Main Movie mode, only the movie would be in the output ISO file. Custom Mode allows you to manually pick the data you need. Step 4. 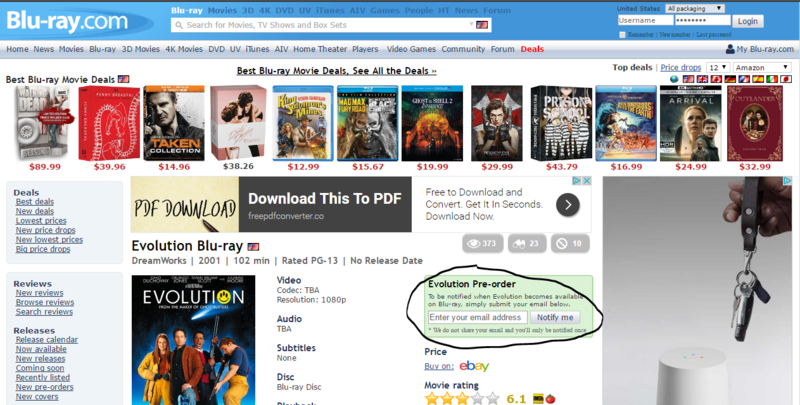 There’s a drop-down menu in the bottom left-hand corner for choosing the Blu-ray format for the ISO image. 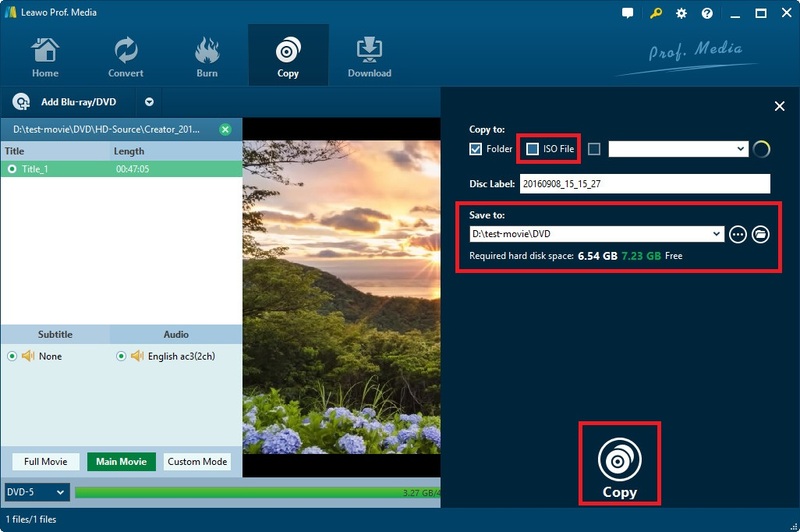 If the format of your Blu-ray disc is BD50, you can choose BD50 to create an ISO image with no compression or you can perform BD50 to BD25 compression to create a smaller ISO image. If your disc is BD25, then you can directly choose BD25 as going for BD50 might not improve the quality but make the output file bigger. There are also options for DVD-9 and DVD-5 formats, but that’ll significantly lower the quality, so you probably wouldn’t want to use it. Step 5. Click the Copy button on top of the video playback window. On the sidebar that comes up from the right, check the box in front of ISO File and select a location for the resulting ISO image file in the output path box below the Save to label. And then click Copy to allow the program to start creating an ISO image from your Blu-ray disc. Leawo Blu-ray Copy is an excellent choice for a Windows ISO maker as it can perform lossless Blu-ray copy. Not only is it a perfect piece of Windows ISO creator software, it’s also an ISO burner that you can use to later burn the ISO image to a rewritable Blu-ray disc. If you really love watching movies on Blu-ray, there’s a great website for you that could keep you updated on the latest releases of movies on Blu-ray. The website is Blu-ray.com. It includes all kinds of information related to Blu-ray. You can find the movies that are about to be released on Blu-ray, review of Blu-ray movies and all other things you can think of about Blu-ray.